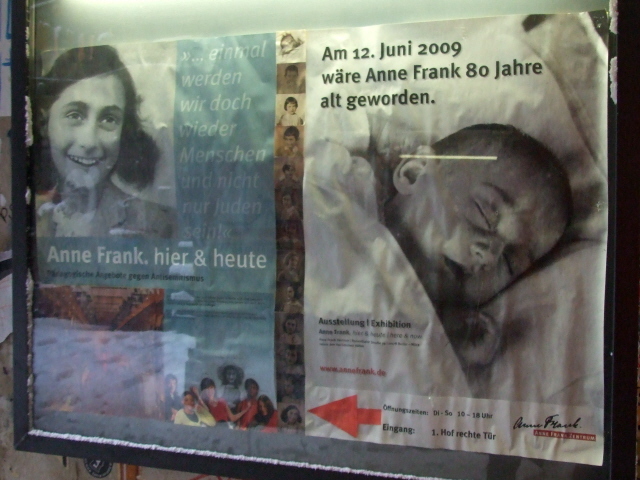 A small exhibition in central Berlin about the life, hiding, betrayal and death of Anne Frank on the one hand, and a youth-oriented peace-and-tolerance-promoting institution on the other. More background info: As you might suspect, the Anne Frank Centre has co-operation ties with the "original", the Anne Frank House in Amsterdam, as well as with similar outposts in other countries. Like these, it is run by a private foundation, which goes back to initiatives started in 1994, when initially a travelling exhibition was being put together. The first permanent exhibition was set up in 1998, and the Berlin Anne Frank Centre moved to its present location in 2002. It is of course a "dislocated" exhibition, as the real Anne Frank had no connections with Berlin. But like with some Holocaust exhibitions in unrelated locations (e.g. the US Holocaust Museum in Washington D.C.), some kind of demand was felt for such institutions in these places too. In the case of the Berlin Anne Frank Centre it's mainly an educational approach, with an extra emphasis on countering xenophobia and racism and promoting peace, understanding and tolerance. The link with Anne Frank, then, is due to the fact that her diary represents the most famous individual and personal story of the Holocaust from the perspective of a teenager. more or less seasoned dark tourists, but rather school groups and other teenagers, who may not even come here altogether voluntarily but as part of pedagogical programmes. Still, it's worth a look when visiting this courtyard (presumably mainly for its other two exhibitions/museums – see below under combinations). If you've already seen the original Anne Frank House in Amsterdam, however, this smaller Berlin branch is much less worth your time and money. What there is to see: The main exhibition room pursuing the Anne Frank theme is not that big. Arranged along two opposing walls it contains various artefacts, documents, photos, etc. (typically on loan from the Anne Frank House in Amsterdam) as well as illustrative texts recounting the associated story and its background. The amount of text accompanying the exhibits and photos is rather limited and often decidedly on the simplistic side – which I assume is primarily a symptom of what the main clientele and aim of the Centre are: educating school-age teenagers. The texts are bilingual, in German and OK English translations. The exhibition is augmented through audio material you can listen to on pull-out ear pieces, and there are also a couple of computer workstations where you can punch up yet more background info. The second half of the floor space (actually occupying more space that the exhibition proper) is taken up by a few "add-ons" – rather strange installations, such as an illuminated blue tent-like structure, inside of which there are little video screens playing clips that feature contemporary teenagers. You can watch and listen to their musings about tolerance, prejudices, migration, racism and the like. It's not really aimed at adult ears, to whom all this may be a bit trying and, well, frankly a bit forced and often overly predictably "PC" … generally difficult to relate to for the more mature dark tourist visitor. Of course, for those who work in education or even themselves are (or have kids) in the relevant age bracket, all this may be much more interesting. The Berlin Anne Frank Centre may thus not be of particular priority to the average dark tourist, especially not to those who have already been to the real thing, the Anne Frank House in Amsterdam. But otherwise you may consider adding on a visit to the place if you are visiting the other two sites nearby (see below under combinations). Location: deep in the courtyard at No. 39, Rosenthaler Straße, past the Museum Otto Weidt's Workshop for the Blind, near Hackescher Markt, in the Berlin district of Mitte. Access and costs: a bit hidden, but not difficult to locate, a bit pricey for what it is. Admission: 5 EUR (concession 2.50 EUR), children under 10 years old: free (although, interestingly, the exhibition's official line recommends it as suitable for children from ten, so if that's adhered to, no one could get this benefit of free admission rendering its statement rather redundant). The regular adult admission fee may seem a bit steep, given the small size and limited breadth of the exhibition – but OK, it is run by a private foundation, so presumably it does not receive state funding, and it's still cheaper than the original Anne Frank House in Amsterdam (though the latter is worth the money much more too). Time required: not very long, at least not for the Anne-Frank-related part of the exhibition, which will be of core interest to the dark tourist. The remainder of the place, especially the youth-oriented sections require only a cursory glance at best or could be skipped altogether by more "mature" visitors. All in all something between 20 to 45 minutes will do, also depending a bit on how familiar you already are with the story of Anne Frank. 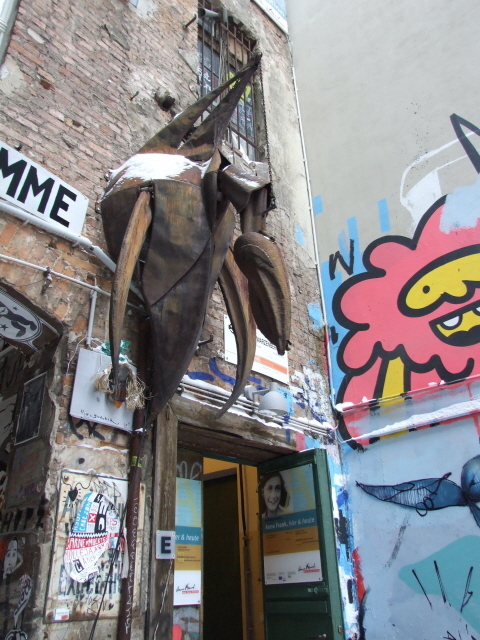 Combinations with other dark destinations: Also located in this typical Berlin ensemble of courtyards at No. 39 Rosenthaler Straße are two more memorial sites of relevance to the dark tourist; and they are thematically similar too: one is the Museum Otto Weidt Workshop for the Blind, which includes a back room where a family of Jews were in hiding when the Nazis' deportations really gained momentum. Thus, the place can actually be regarded as thematically closer to the original Anne Frank House in Amsterdam than the Anne Frank Centre Berlin itself! Next door, right at the archway to the courtyards at Rosenthaler Straße 39 is the "Silent Heroes" Memorial Center, which honours resistance against the Nazis in the form of help for persecuted Jews from a wider perspective. It can thus be regarded as the overarching theme for both of the other two places. For more combinable dark sites see under Berlin. Combinations with non-dark destinations: Just round the corner, at No. 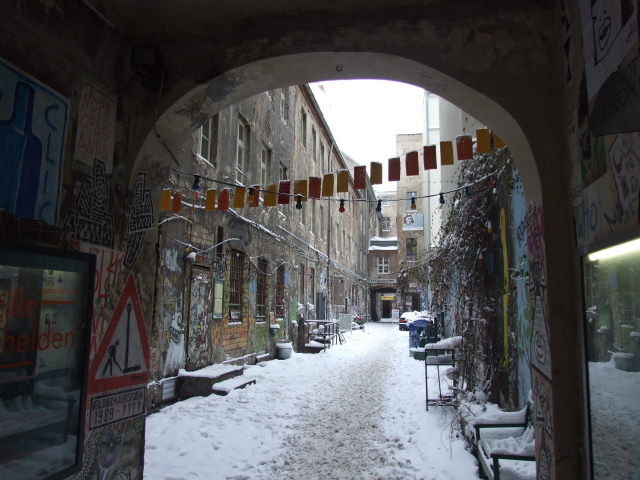 40 Rosenthaler Straße, another archway leads to the shiny Hackesche Höfe. That's another set of courtyards, but very different to those that the Anne Frank Centre is located in (which is more an "alternative", arty graffitied "scene"). The Hackesche Höfe, in contrast, have become a mainstream tourist attraction precisely because they've been so stylishly refurbished – and commercialized, with boutiques, posh restaurants and the like (cf. Silent Heroes Memorial Center). The heartland of tourism in Berlin is just a little further south – with the "Museum Island", Alexanderplatz, the cathedral, Unter den Linden boulevard and the iconic Brandenburger Tor at its end as its main tourist draws.